Author Suzanne Palmieri who earlier brought to us delightful stories such as The Witch of Little Italy, The Witch of Belladonna Bay, I’ll Be Seeing You and Empire Girls returns with her most ambitious novel yet, a sweeping story of love, heartbreak, forgiveness, redemption and family in The Witch of Bourbon Street. But the novel is unlikely to sweep many readers off their feet as it is a tad slow in its pacing, though Suzanne Palmieri has managed to craft an incredibly haunting story that many readers would love to revisit again. 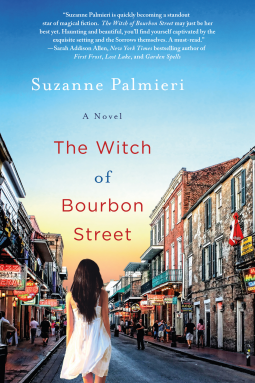 The Witch of Bourbon Street by Suzanne Palmieri is about the past and its reverberations in the present, casting a cloud of uncertainty for the future, in the once magical Sorrow family living in the bayou of New Orleans. It is the story of Frances Green Sorrow who was considered special, someone who would restore the honor and prestige of the Sorrow family. But she has other plans. She ran off, and got into a hurried marriage with Danny Amore which lasted as long as the birth of her son, Jack Amore Sorrow. Frances returned home, keeping to herself and shunning the outside world, completely detaching herself. But this time things didn’t go as she planned. Her son disappeared, mysteriously. The story actually began on August 14, 1901 with Sister Vesta Grace’s confession. It was an uneasy time. All but one member of the once well-known Sorrow family had died. It was rumored that Sister Vesta Grace had a hand in their death yet there were others who believed it was the voodoo witch, Rosella. It remained unsolved for over a century. As Frances ventured out of the confines of the Sorrow Estate in search of her son, she stumbled on secrets that unraveled the mysteries of the past, opened the floodgates for its healing and set the ghosts that haunted the family free. Employing the alternating chapter method, the story moves back and forth between the past and the present, with shifting points of views from Frances, Jack, Danny, Millie and Sippie Wallace, and a peculiar dialogue which some may find difficult in the initial stages. While the story is enjoyable to a certain degree, some may find it tough to wade through the first half of the book which was a little bit trying. But once you got through, you will find everything falling into place nicely. I am trying to contact this blog for a book review request but I do not see any email or submital info here. Please email me at jnunez0516@gmail.com. thank you!